There is a great of noise about how expensive some New Zealand shares have become. Indeed, it is a theme that we have discussed in previous Castle Point investment commentaries. Those discussions often lead to reviewing what price to earnings multiple the company is trading on. And in that context, if a company’s share price is reflecting a valuation that is over 20x current year earnings that company is expensive. That said, the growth rate of earnings can change the picture quite dramatically. Please note this discussion is only referring to profitable companies, pre-profit businesses such as Xero and Pacific Edge have a calculating error if one attempts to divide their market cap by their current earnings. To keep the maths simple, imagine a company that is trading on 30x current year’s earnings. Now, that looks expensive in anyone’s book, you are firmly in the heady valuation territory of Auckland International Airport. The key valuation question is, how long it will take for earnings to double so that the company would be on 15x earnings? If this is going to take at least 20 years, as may well be the case with Auckland Airport, something odd is going on, essentially the current share in unjustifiably high. However, imagine though, that the company on 30x is growing rapidly, and the market believes that it can double earnings within four years. In this case you would argue that the current share price is underselling the true potential of this company. If that type of growth rate, or anything close to it, can be maintained then there is no way that the shares will trade at 15x earnings in four years’ time. It is far more likely that the shares will still be trading on 30x and that means the share price will have doubled, even though the market fully expected the earnings growth. Indeed a logical investor could then have been prepared to pay up to 60x earnings for this company given its strong growth profile. But such an investor seldom needs to pay that much for these types of companies. The main reason for that is the dwindling price discovery that often occurs with these types of companies. A considerable number of investors baulk at paying 30x earnings for a company even though they may accept there is every likelihood of strong growth in earnings. To them the stock is too expensive to buy, they might if it traded lower but often that never happens. So what you end up with is an under-pricing very much like in the scenario described above. Right now, Corporate Travel Management could very well be the company described above. In the past three years this fast growing company has doubled its earnings per share. Market consensus is agreed that it will continue to deliver rapid growth and will double earnings again in three to four years’ time. This is a high quality business that has global markets that offer massive growth potential. So the ability to double earnings again and then again is eminently feasible. 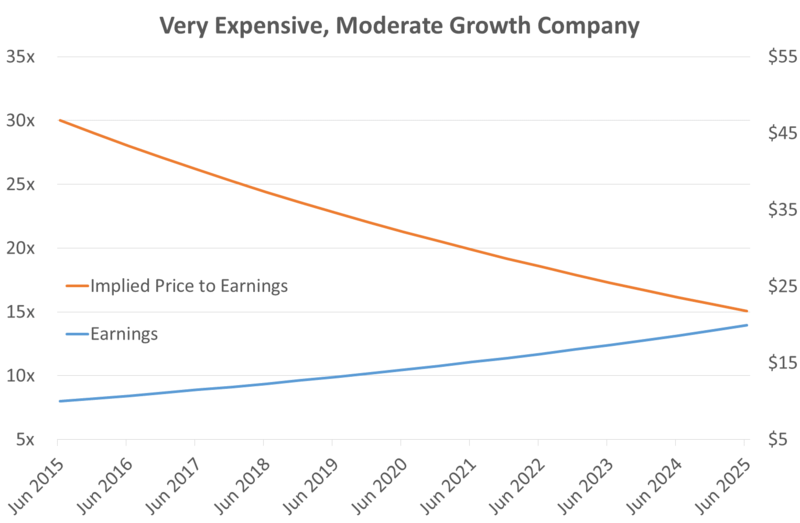 And just like in the example above, it is trading on around 30x current earnings, even though it has proven capable of delivering strong growth. Investors continue to baulk at paying that price despite its proven track record of growth. However the rational investor will happily pay that price knowing that if the company does as the market predicts and doubles earnings in the next few years, then there is every chance that the share price will also have doubled. It should be noted that this discussion is framed in a bull market context. If we enter a proper bear market, then even companies that are growing strongly may be de-rated to 20x earning or even less. But if earnings do indeed double as expected the share price of Corporate Travel Management will still have risen around 50%, still an acceptable return. The key to the opportunity that we see for holding stocks like Corporate Travel Management and Vista Group International is; because they look “expensive” a lot of investors won’t pay up to own them. That in turn means that the market starts to become less efficient at pricing their long term intrinsic values. And that leads to opportunity. Sometimes, the higher the better.